June came and went, and it brought the blazing hot summer with it. However, that didn’t stop us from eating! We had some truly fantastic food this past June. It seems that our round up from June includes food perfect for this warmer weather and pork. I assure you, that this was unintentional albeit a bit humorous. So lets get talking about this food shall we? 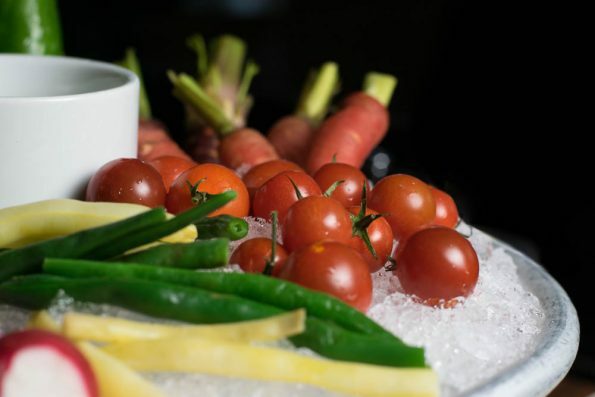 Paul Martin’s Vegetable Crudités- While crudités may not sound terribly exciting, the crudités plate offered by Paul Martin’s American Grill was actually fantastic. Keeping in line with their commitment for the freshest ingredients, the vegetables offered were fresh and crisp! Served on ice, they maintained this crispness and their chill until they were finished (and we devoured just about all of it). The main star of this appetizer however, was the Green Goddess dressing. Made in house, it was jam packed with flavor. We were tempted to eat it by the spoonful! The Herb Box’s Thai BBQ Baby Back Ribs- As we mentioned in our review, the sauce on the ribs was truly spectacular! It was spicy and had that great sweet and cilantro-esque flavor you’d expect from an Asian style sauce. We also noticed that the sauce really brought out the gouda in the mac-n-cheese! These ribs were so tender that the meat basically fell off of the bone! It will be hard to try anything else on the menu now that we know how good these ribs are! Ahipoki Bowl– This is sort of different from the typical because there isn’t any one menu item that we can suggest. The bowls are custom to your taste (they don’t even offer a pre-made bowl). We tried them a few months back when they first opened and again in June. We are sold! 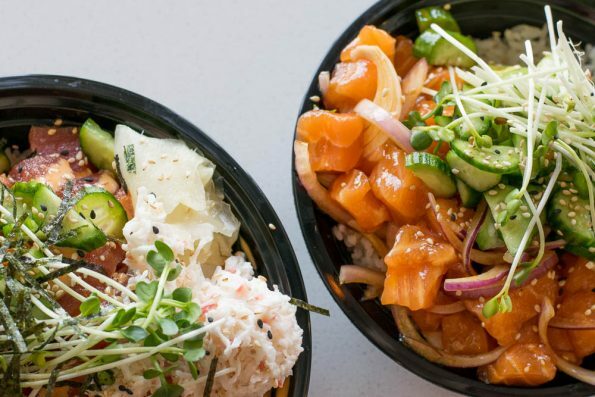 Poke bowls may be the best thing on Earth and are perfect for summer! We can tell you though, that everything we’ve tried at Ahipoki Bowl is fantastic (we also love that will do extra masago)! 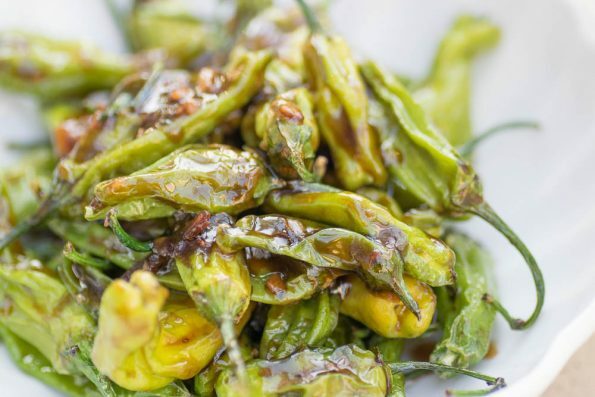 Sushi Roku’s Shishito Japanese Peppers- When we reviewed the Happy Hour menu of Sushi Roku we raved about these peppers! We still can get them off of our mind! Served blistered and with oyster sauce, they aren’t anything you might consider fancy. BUT, and it is a huge but, they are super tasty! Like we literally had to move the bowl to save space for the other food we were trying and we fought over the leftovers. 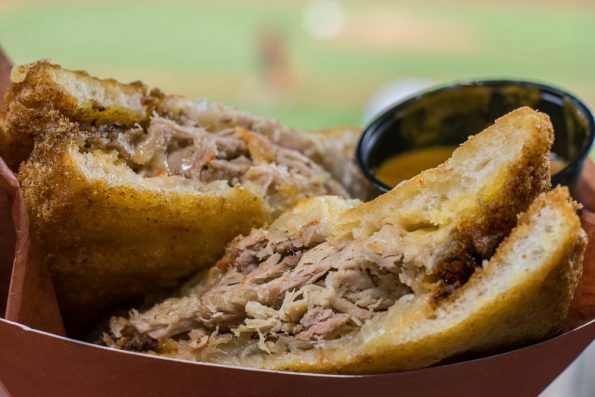 Chase Field’s Pit Viper Sandwich- We tried this beast of a sandwich and were floored at not only how heavy it was (seriously, it weighed at least a pound), but also at just how good it was! The Snake Bite BBQ sauce is spicy and smoky (is it bad that we want a bottle of this stuff at home?) which helps cut the richness of the fatty pork. Like we said in our original post, this sandwich is the manly version of the Monte Cristo! Brat Haus’ Pork Two Ways With Watermelon and Greens- This was served at Brat Haus’s Beer dinner with OHSO Brewery. 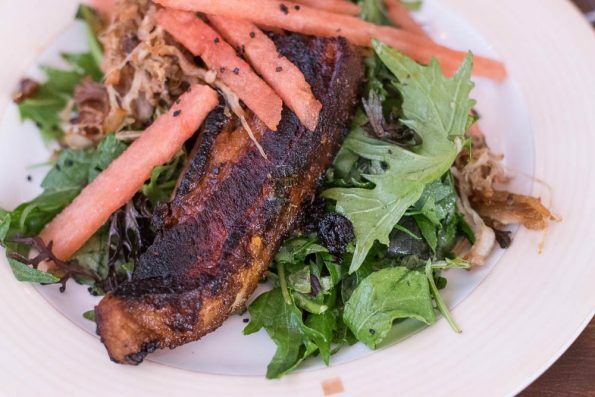 It featured sweet and spicy glazed pork belly over bitter and tender greens with watermelon and topped with roasted pork belly confit and apple cider vinaigrette. Both preparations of the pork were divine! Brat Haus’ chef constantly says he dislikes vegetables but he consistently makes some of the best veggies we’ve ever had. Honestly, the spinach served with the main course was even better than this salad but we didn’t get a photo! Well that wraps up June! We can’t wait to see what July has in store for us! With Arizona Breakfast Weekend this month, there is a chance that we might even have some breakfast items on July’s round up! What were some of your favorite things that you ate last month? We’d love to hear! Leave a comment below or use the hashtag #GeekEats! Until next month, Happy Eating! I love those shishito peppers at Sushi Roku as well! So simple and good! 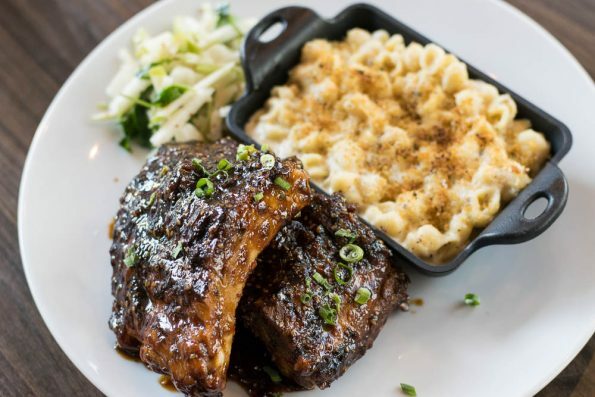 I really need to try those ribs at Herb Box. Yum.